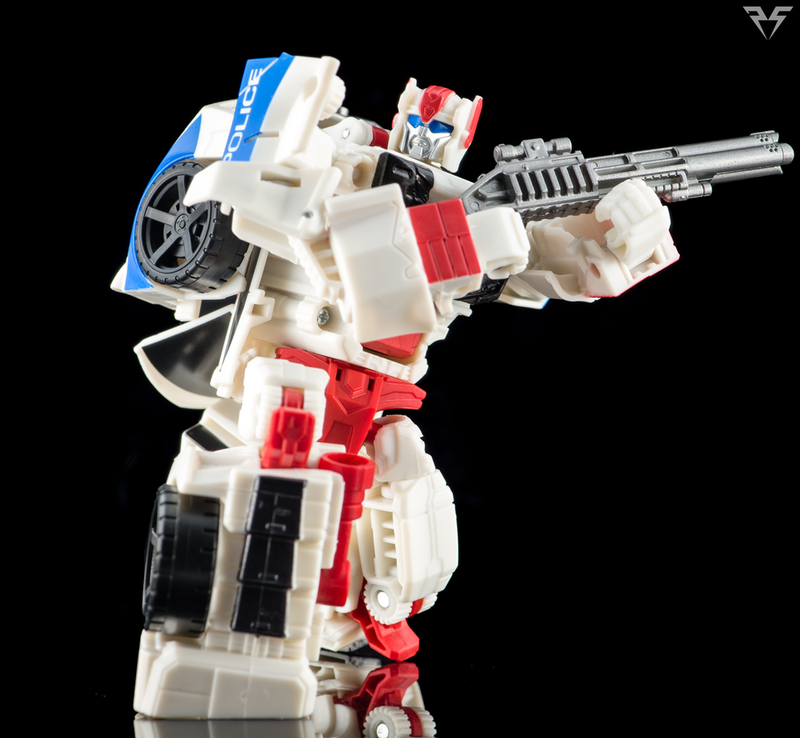 In this review we are going to take a look at the Autobot Protectobot, Streetwise. Streetwise is a heavy retool and repaint of Stunticon Dead End and as such I will not be going in depth on posability or transformation. Streetwise’s vehicle mode is a sleek and aggressive looking sports car; the kind of police car that would look at home in a Need for Speed game or a high speed action movie. He’s got the lines and looks of a Ferrari or Lamborghini, with a very clean and visually attractive police deco. 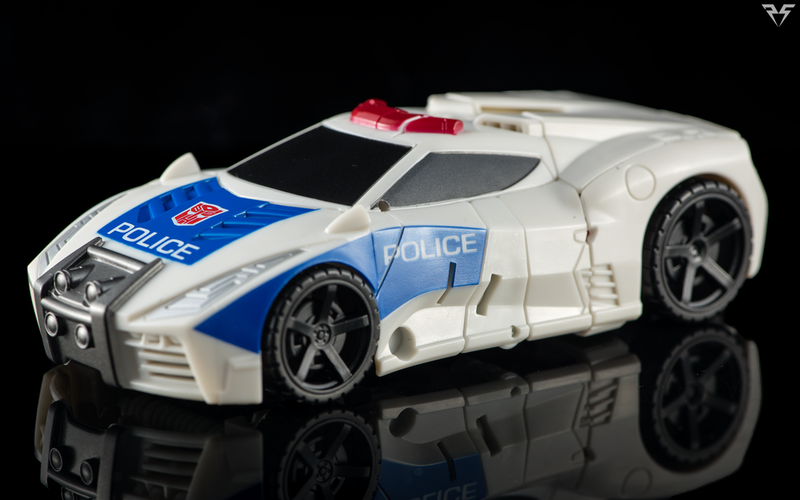 I’m a sucker for bots that turn in to over the top police cars and similar rescue vehicles (Prowl, Red Alert etc…) and Streetwise delivers in a fresh and exciting way. The additional lightbar on the roof is a nice touch and looks great. While most police vehicles have black rims, I do feel that a bit of paint work on the rims would really make this figure pop especially considering that the rim design is more of a sports/designer style. The front portion of the vehicle is very nicely painted and decorated but from the driver’s door back it’s pretty much just white plastic. 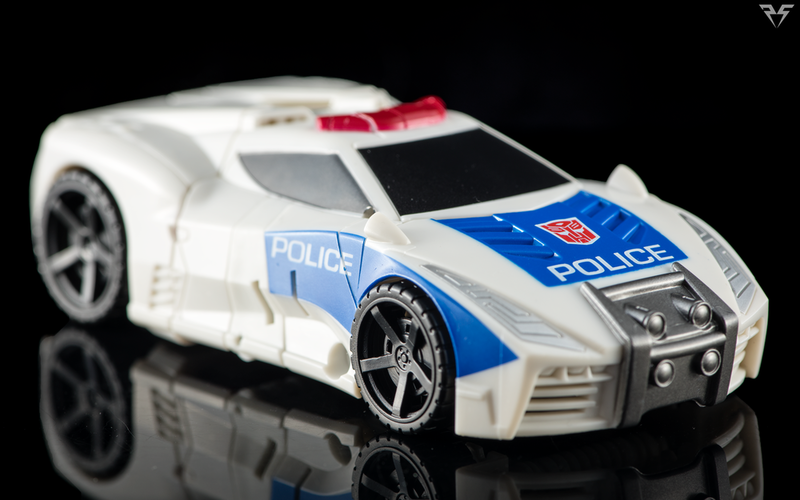 The figure could use a ton of paint work on the rear, or if you prefer I believe a repro labels set is also available to add an extended police deco that covers some of the rear of the vehicle. Like his alt mode Streetwise is mostly white in his bot mode. He has some nice red details and a gorgeously painted chest cover with an Autobot insignia in the middle. Ultra Magnus would have no qualms with his dead center badge positioning. He has the same posability as Dead End and my only real gripe is the continuing lack of wrist swivels. He doesn’t really have feet either as much as he has…flat bits sculpted to form an A stance. That being said they look ok standing still, but in motion they can look a little incomplete. Like Dead End his wrists have the same incredibly stiff ratchet when unfolding from his forearms, they feel stiff but I am not worried when unfolding them. There is a small notch on the red plastic when transforming him back in to vehicle mode that can provide a lot of resistance when trying to lower the front part of the car in to position. If the notch is too large you can shave it down to ease the transformation process. 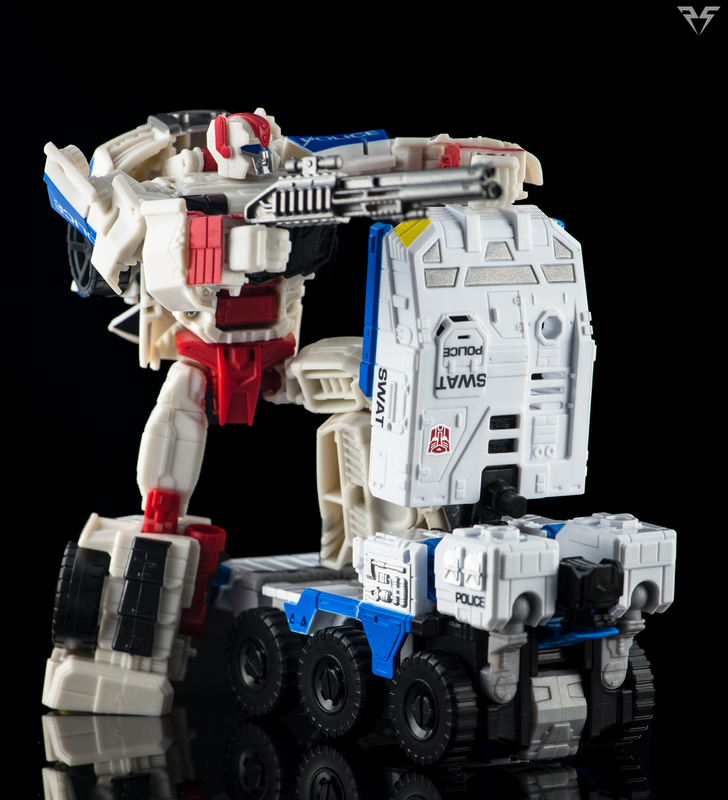 Streetwise comes with a new weapon, a triple barreled shotgun with a scope! His combiner weapon is the same as the one that ships with Dead End, but in black plastic instead of purple. The new shotgun accessory has a nice sculpt and is a welcome addition instead of another of Dead End’s strange exhaust pipe guns/bludgeoning devices. He can hold the shotgun in his hands of course, or peg it or the combiner weapon in to the ports on his shoulders. The same ports can be used to mount the shotgun as a sort of vehicle exhaust in his police interceptor mode. Unfortunately much like Dead End, there is no engineered integration of the combiner weapon in alt mode, it can merely peg in to the top hole on his roof to sit awkwardly as some sort of cannon/turret. Final Thoughts Streetwise’s heavy retooling (practically all new vehicle shell, head and chest as well as weapon) make him far more than a simple repaint or reuse of the Dead End mold. Streetwise stands on a pedestal all his own and is my personal favorite of the three original Protectobot limbs that Hasbro has released in the Combiner Wars line up. While I would love to see a little more paint and tampograph application, especially on the rear of the vehicle, I’m sure a lot of the budget for this figure went in to all the new parts needed to make him unique. I can always add paint or stickers myself, and personally if this is the direction Hasbro is going in, I would prefer the money be put in to retooling or new parts rather than paint. As far as a standalone release I would say Streetwise and Rook are equally fun if you only plan on picking up one of the Protectobots (Weirdo). Rook’s coming up next on the list so hold tight and the review should be up soon!